Cheap Personalized Nylon Drawstring Backpacks w/ Zippered pockets. Promotional, Custom Printed or Blank. Budget Prices in USA and Canada. On Sale today! Please see the Price Table below. Nylon Drawstring Backpacks -Sports Packs, made of 210 Denier Nylon, with front zippered pocket, slot for Ear Buds and contrasting, simulated leather reinforcement black trim at the corners. It may be carried over the shoulder or as a backpack. Our high quality sturdy backpacks are currently on sale: 30% reduction from the regular price! Fast production: 3-7 days. 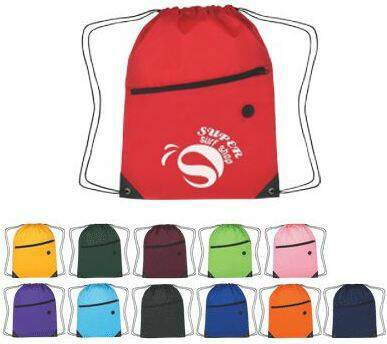 Budget Prices in the USA and Canada for nylon drawstring backpacks with zippered pockets.